Sardinians have been making a brave showing here in New York in recent days. 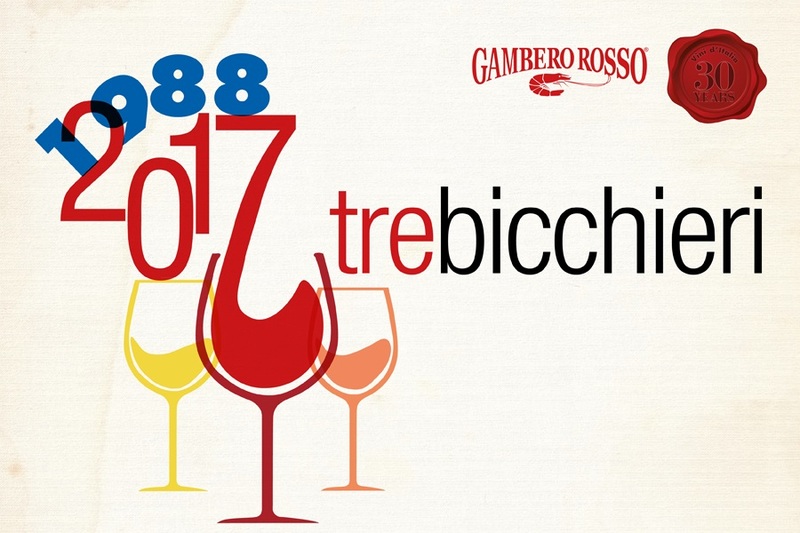 First Sella & Mosca, the large, 114-year-old firm that has been named Gambero Rosso’s “Winery of the Year” for 2013, presented a selection of its line of wines in a luncheon at Ai Fiori restaurant. Then the consortium of producers of Carignano del Sulcis offered a whole slate of Tre Bicchieri winners during a luncheon at Eataly’s Scuola Grande. All told, probably too many calories for my ever-growing middle, but a very fine and interesting collection of wines. For an island that has been invaded, conquered, and owned over the centuries by so many diverse peoples, from Phoenicians and Carthaginians to Arabs, Genoese, French, and Catalans, Sardinia remains the most isolated region of Italy. It’s a land where in some respects time stands still. The island’s language – it’s an injustice to call it a dialect – sounds like late Latin. Neolithic monuments dot the countryside. Pre-phylloxera vineyards of grapes still on their own roots are numerous, as are indigenous varieties. For wine-lovers, those last two facts should be enough to attract attention, but until recently that hasn’t been the case. The quality of the wines I tasted on these two recent occasions promises to change that, however. 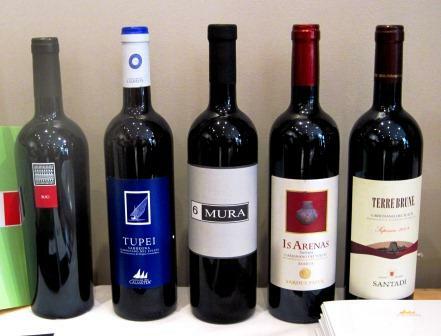 Sardinia has been making notable wines for some time – and as the flurry of Gambero Rosso awards should indicate, somebody is finally noticing. 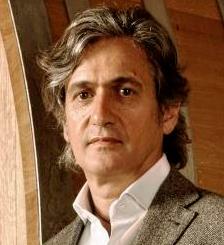 Consulting enologist (and talented Piemontese winemaker in his own right) Beppe Caviola presented the Sella & Mosca wines. They started with two whites: 2011 La Cala (100% Vermentino) and 2011 Terre Bianche (100% Torbato). Vermentino can be considered a Sardinian specialty, and Torbato a Sardianian almost-exclusivity. The La Cala is a very decent, inexpensive (about $12) example of Vermentino. Light and bright, with herbal, floral, and sometimes citrus notes, it is a very pleasing thirst quencher and partner to fresh seafoods. Caviola detected rosemary and oregano in the aroma; I have to confess those went right by me, without detracting from my enjoyment of the wine. The Torbato variety is a rarity, and Sella & Mosca one of the very few bottlers of it. The grape was down to a nearly invisible 10 hectares in all of Italy in 1970. Now it boasts a strapping 143 (! ), of which Sella & Mosca controls 100. It makes a delicate white, a touch shy until it has a chance to breathe a bit, when it begins showing more forward floral and mineral qualities. Some lunchers tasted white fruit in it, but I was more struck by its flinty qualities, perhaps the result of its ancient-marine-sediment vineyards. An intriguing white wine, and one that may reward aging. and a mini vertical tasting of 2004, 2005, and the Tre Bicchieri-winning 2006 Marchese di Villamarina (all 100% Cabernet sauvignon). The Villamarina, as the Tre Bicchieri award might indicate, is the showpiece of the Sella & Mosca line. The firm made a serious commitment to Cabernet some decades ago, and it has followed up with meticulous vineyard care and attention in the cellar: small French oak casks for 18 months, then a year in larger oak, and then another 18 months in bottle before release. Villamarina is expensive (about $75) but worth it: All three vintages showed soft tannins, with an excellent balance of acid and soft, dark fruit. They also displayed cedar elements in the aroma and on the palate, reminding me of good red Graves – which is distinctly a compliment. I am no great fan of Italy’s versions of French varieties, but this one is very well done, with a nice blending of Bordeaux and Mediterranean qualities. The ’06 Tanca Farra was for me the least successful of the reds. The combination of Cannonau and Cabernet seemed to my palate simply to emphasize the tannins of both. Maybe these will soften with time in bottle, but at the moment they seem to me excessive. The 100% Cannonau had no such problems. It was very true to the variety – Cannonau is what the Spanish call Garnacha and the French call Grenache – and fine: Earthy, mushroomy aromas preceded similar flavors on the palate and a fine, sapid finish. 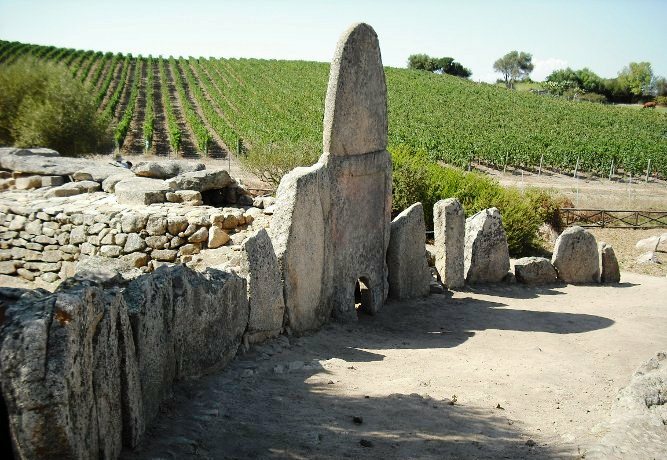 Interestingly, the grape – long thought to be native to Spain – may well have originated on Sardinia. Santadi’s Terre Brune (Carignano del Sulcis DOC Superiore 2008). 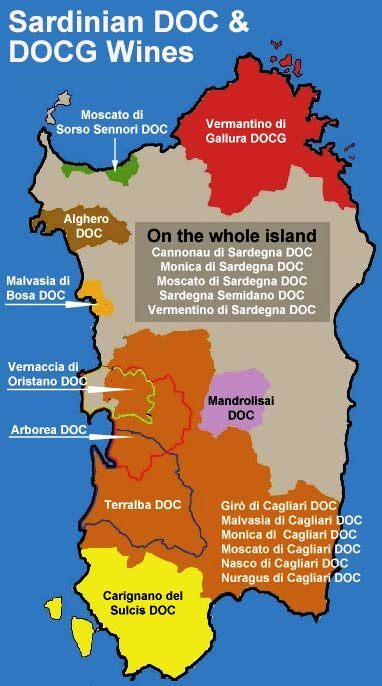 Carignane is a variety that almost everywhere except Sardinia is used for blending. Only in the island does it get the kind of attention it deserves. The Sulcis zone comprises the south-eastern corner of Sardinia plus a few tiny offshore islands. Here, Carignane seems to do better than it does anywhere else in the world (there is in fact a chance that the variety originated here about 4000 years ago). Because there are so many sandy soils, Carignane here often grows on it own roots. And because of the very dry, hot summers and the strong winds, it is almost universally grown as alborelli – short, upright bushes – rather than on wires. The producers vary enormously, from co-ops like Sardus Pater and Santadi to large firms like Sella & Mosca and small ones like 6Mura. But the wines they make share many similar characteristics. Carignane in the Sulcis zone makes a paradoxical wine: It is at the same time soft and also lean and muscular, simple and rustic at first and increasingly elegant and complex as you sip. The first three wines at the Eataly lunch – Buio, Tupei, and the 6Mura Rosso – all stressed smoothness and depth, with dark earthy flavors and long-lasting finishes. Sardus Pater’s Is Arenas differed in displaying more obvious acidity, leanness, and muscularity, while Santadi’s Terre Brune showed the most complexly of them all, with dark fruits, nuts and earth first appearing in the aroma and then increasing in intensity and complexity right through to the finish. Interestingly, while all the other wines were vinified from 100% Carignane, this wine – on whose creation the almost legendary master blender Giacomo Tachis, of Sassicaia fame, has consulted for years – blends 5% Bovaleddu. That grape may be the same as the Spanish Graciano, which once upon a time was very important in Rioja blends, and might just be contributing that extra little touch of complexity to Santadi’s Carignane. 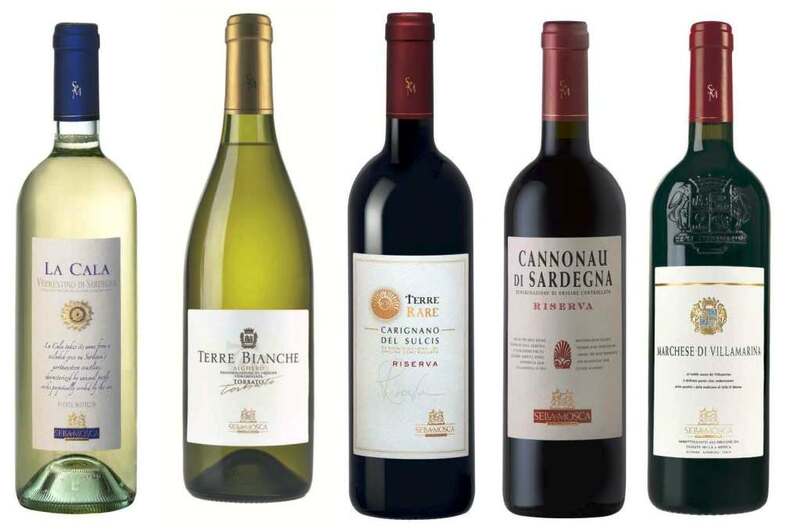 Sardinia’s wine production is amazingly varied – these two tastings presented just a fraction of it – and well worth exploring, before it attracts more prizes like the Tre Bicchieri and the price rises that inexorably follow them. This is not a case of caveat emptor, but of carpe diem – to speak in almost-Sardinian.